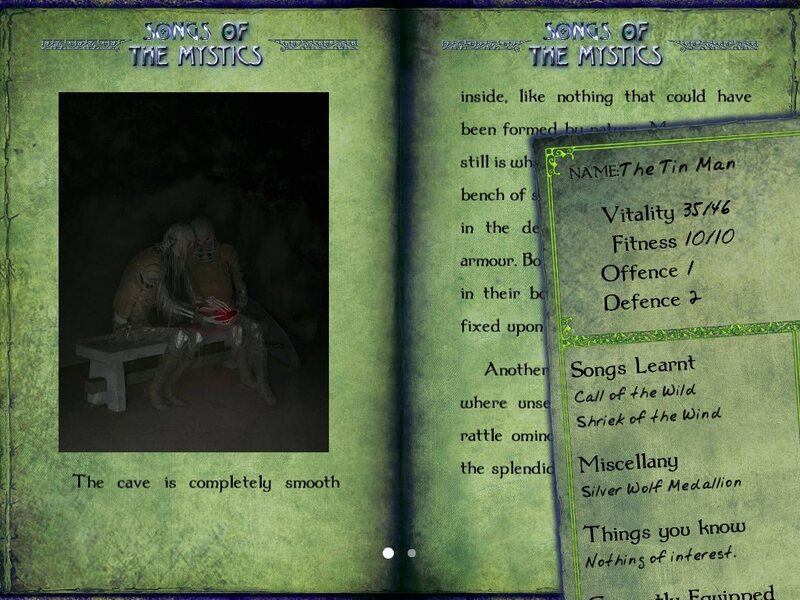 Tin Man Games wastes no time in Gamebook Adventures 11: Songs of the Mystics, as the player is in trouble right from the get-go. Trouble of the downright lethal kind! (Cue dramatic music.) Not that this should surprise anyone, seeing how the protagonist is the daughter of the Earth Queen. The right choices might get you out of this mess in one piece, while the opposite… not so much. But while choice-and-consequence is a big deal in this interactive tale, there’s also fighting to do, people to interact with (in a more peaceful manner), and of course, songs to learn. Songs which in turn enables the learning of magical feats. That’s right, magic! Oh yeah, on top of being royalty, you are also leader of the Mystics. Not too shabby. Aside from the whole ‘someone wants you dead’ ordeal, anyway. Now, as for exactly which affiliation has you marked by ruthless assassins however, and perhaps more importantly, why, shall not be revealed here. Because spoilers are bad. On the technical side of things, the gamebook is similar to other Tin Man Games releases, in that it features automated inventory management, dice rolls, bookmarking, difficulty levels, achievements and collectible art, as it were. And not just that: Songs of the Mystics, being part of the Gamebook Adventures series and all, is in fact… wait for it… not a case of print-turned-digital. As such, credit where credit’s due, Kieran Coghlan wrote the tale, while Pirkka Harvala provided illustrations. Groovy. Gamebook Adventures 11: Songs of the Mystics is available for iOS (iTunes) and Android (Google Play, Amazon) with a $5.99 price tag – no IAP.